Trails and Travelogues: A Shopper's Lucky Day Before Turkey Day! Guys, just check on Sears Pre-Thanksgiving Sale. Have you seen the amazing deals yet? You can either visit them online (just click on the underlined link above), or visit any Sears store nearest you. Well, it's probably time to get lucky and grab the chance of getting big savings from Sears, don't you think? At least, you get peace of mind by the time you're on, celebrating the big turkey day!...with a blast! :). From home appliances, kitchen appliances and many more, you can get savings for more than $100. A cash back of 15% after mail-in rebate is also available for all appliances that worth more than $499. Quite a good deal, right? 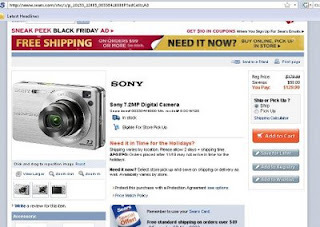 And here's one that I consider a perfect gift for your family, friend or just for yourself; - a Sony 7.2 megapixel digital camera for only $129.99...that's after $50. instant savings! I think this would be the best thing to have for the big turkey day celebration. You deserve to have one to capture all the memories of celebrating Thanksgiving Day with your loved ones!...and where else can you get a good deal? That's only when you get it at Sears! And that would also be the time wherein you consider yourself a lucky shopper, right? Buying your Sony camera is worth it after all...with a good quality and a good price rolled into one.